Recently, I was asked to show my photo ID at the LCBO. I had my 42nd birthday this past spring, so I couldn’t be happier! I see a lot of people in my office for a lot of different things. Sometimes people come specifically to discuss things they can do to look younger. Sometimes they come for something else but the conversation often comes around to the same thing…. 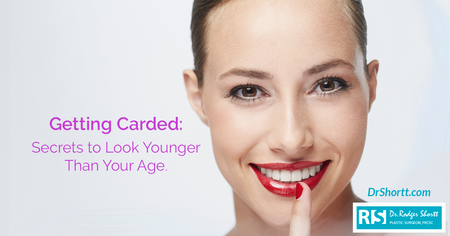 how to look your best for your age. Deflation refers to the loss of volume that the soft tissue and bone experiences over time. Lots of studies have demonstrated this. This is where fillers and fat grafting have really taken facial rejuvenation to the next level. Twenty years ago, no one would have considered this. When people started to look older they had a face lift. That would tighten tissue and re-suspend the remaining soft tissue. However, it was only with the use of fillers and fat that the more youthful fullness that people had when they were young could be returned to their face. Descent is gravity pulling down. With time, gravity starts to create lax skin, jowls, heavy lids, loose necks, and folds around the mouth. When this first happens, there is still time to correct and conceal it without surgery. This is where fillers, lasers and Botox can help significantly. However, if the descent is too severe, then these treatments alone are not enough and surgery such as a face lift, brow lift and eyelid surgery (blepharoplasty) are needed. Deterioration refers to the wrinkles in the skin. It refers to the pigmented spots and the broken blood vessels. It includes the flat, dull appearance of the skin. This is where Botox and laser can have amazing results. Botox does wonders to soften wrinkles especially around the eyes and between the brows. It can make people look refreshed and happier. Lots of people come to the office simply to minimize the scowl between their eyes that people tell them makes them look mad all the time. It will lighten or remove pigmented spots. It will minimize or delete broken vessels and red patches. It will erase fine lines completely and minimize the deeper ones. Nothing works around the mouth for wrinkles like laser resurfacing. It has been shown in studies to reorient collagen fibres, to stimulate new collagen and to literally turn on RNA (the signal to make proteins) that is usually only found in young people’s skin. Well, that really depends on your individual concerns and goals. That is what a consultation is for. I realize that there are a lot of options and not everyone can do all of them at once. It is my job to assess you and help you to decide which option is going to give you the best bang for your buck. Aging does not happen in isolation. We all have all of these D’s taking place all the time. There isn’t “one thing” that can fix everything. When you go to a salon or a non-surgeon’s office, you may only be offered one or two options. As they say, “When you are a hammer, everything looks like a nail”. When all you have are fillers or Botox, then all patients look like they need fillers or Botox. That is simply not the case. Everyone has individual needs. At our office we make every effort to offer the perfect solution to each patient’s individual aging concerns. Do you want to know how it feels to be carded at 42? It feels great! If you are interested in learning more… and what my secret is… or having a consultation to discuss anti-aging options that may be right for you please click here or telephone 905-849-4282. Dr Rodger Shortt strives to be the best plastic surgeon in aesthetic, reconstructive and cosmetic procedures. He is committed to providing high quality patient care and achieving excellent results. He is considered one of the top plastic surgeons and one of the few plastic surgeons in Canada that has the top rating of five stars in Realself, Rate MD, and Ontario Doctor review. Dr Rodger Shortt is a specialist plastic surgeon who graduated from Queen’s Medical School in 2004 and became certified by the Royal College of Physicians and Surgeons of Canada in 2009. He received further sub-specialty fellowship training with international plastic surgeons in micro-vascular breast reconstruction, cosmetic plastic surgery, and body contouring after bariatric (gastric banding) surgery, significant weight loss or post-pregnancy.